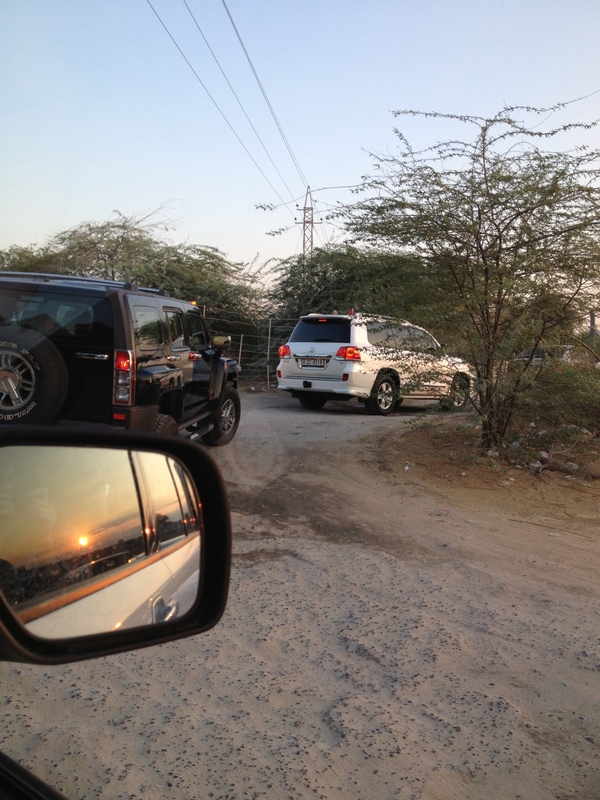 Sure Honey, this is a sanctioned U-Turn spot…. NOT. Let’s just drive through this place, OK? Doesn’t matter that it’s not a freekin ROAD. This is a dang drainage ditch, I swear. 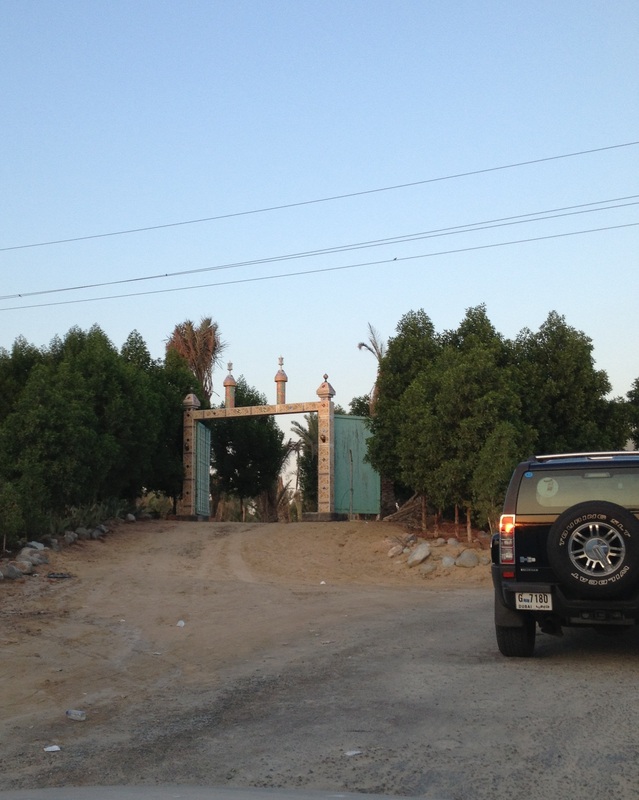 Little bit of background information for you….. the roads here are AWESOME. Really well-constructed, smooth, banked, nicely done. And the road department has taken a big potential accident-causer, the dreaded “left turn crossing traffic” out of the equation here as much as possible. Honestly, I see why. There are no common courtesies here, no respect for other drivers, it’s just pretty much a free-for-all. And if there were left turns crossing traffic allowed, they would. Whenever they want. Whenever they’re ready. Without waiting for traffic to clear. So to alleviate this need to make these sort of murky decisions (“Do I pull out in front of all three lanes of traffic, or should I wait till it clears?”) road designers use two things to control traffic, round-a-bouts and u-turns. Generally, they’re helpful. Unless of course, there’s not one where you want/need one. Here starts this particular adventure. Apparently, on whatever particular road we were on, if you go and do the official U-Turn thing to get going the opposite direction on this particular highway, it’s about 6-8 miles, then the U-Turn, then 6-8 ,miles back. Most people here are so totally not gonna do that – no patience…. And TBG said he’d been seeing them making this odd u-turn deal, but he never did it. Till this day, with me. Joy. Yeah, this guy changed his mind. So he stopped, backed up, turned around, and is now trying to decide what to do. Not uncommon. 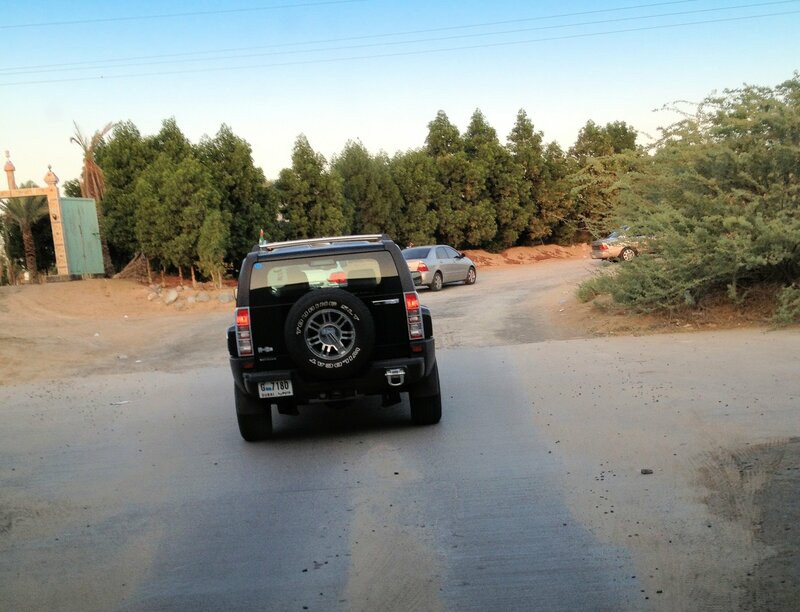 So, we bump completely off the highway to the right, and follow this line of cars down the hill…. almost like a US exit ramp. Except there is no road. It is sand. Ahead, the cars are turning to the left, headed under the highway. 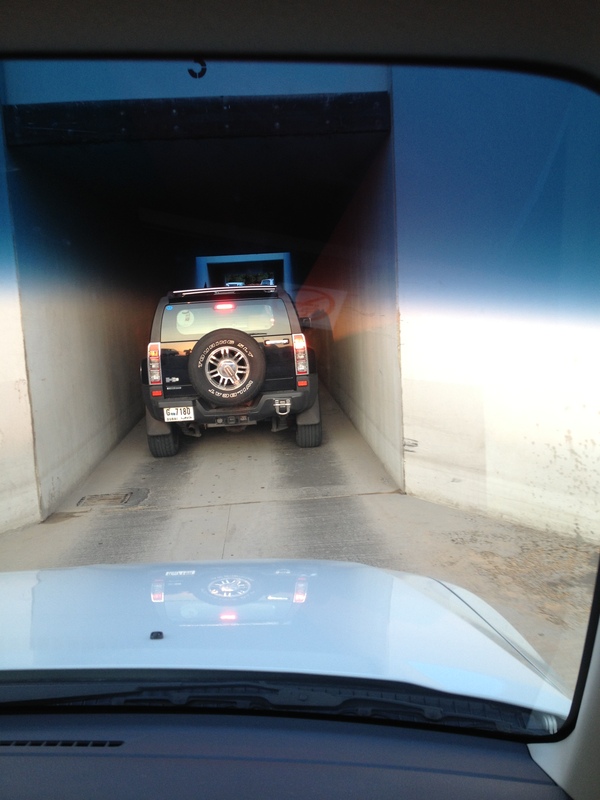 I kept saying “Honey, this is a drainage ditch, we are about to drive through a culvert under the 5-lane highway above.” Cars in front of us had to pull their mirrors in so that they didn’t scrape the sides of the culvert thing. At least there’s no water in it from the recent rains. And it’s dark. And tunnel-y and creepy. And there are probably spiders in here. OK, we’re finally under it……. There’s a patch of sunlight above, and I feel my panic start to lessen. Till I realized that we’re only halfway through this short-cut. Then we drive under the next 5 lanes…..
then bump up about 8” of asphalt, wait for traffic to “clear”…. 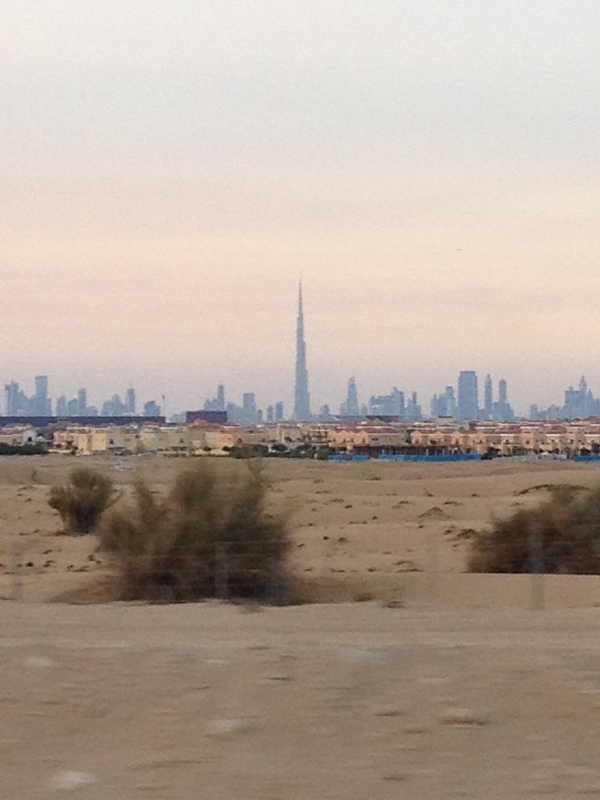 And I say that with quotations because Dubai traffic never ever never ever clears….. the goal here is to find a vehicle you can intimidate into moving over. Preferably something smaller than you. In the words of one of my favorite “Michaelisms”…. “Raw tonnage rules the road”- this so applies here! And bam – we’re on our way. Now, let’s break this down…… even if it’s about 12 miles outta our way, and that would have taken us not very long since everyone here drives about a hundred miles an hour….. it would have taken us about 15 minutes to make the u-turn. 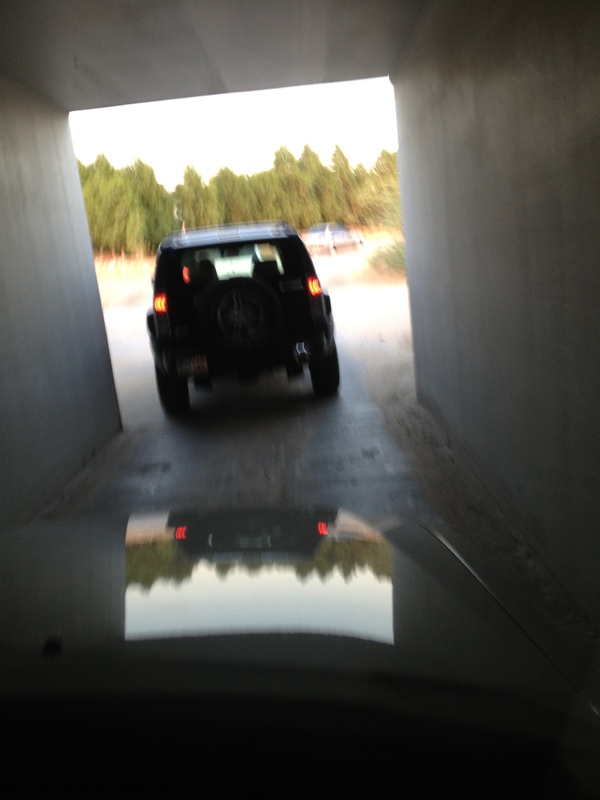 But nooooo…… we drove through the drainage ditch, saving at LEAST four minutes off that time. So driving in the drainage ditches really *does* save time! 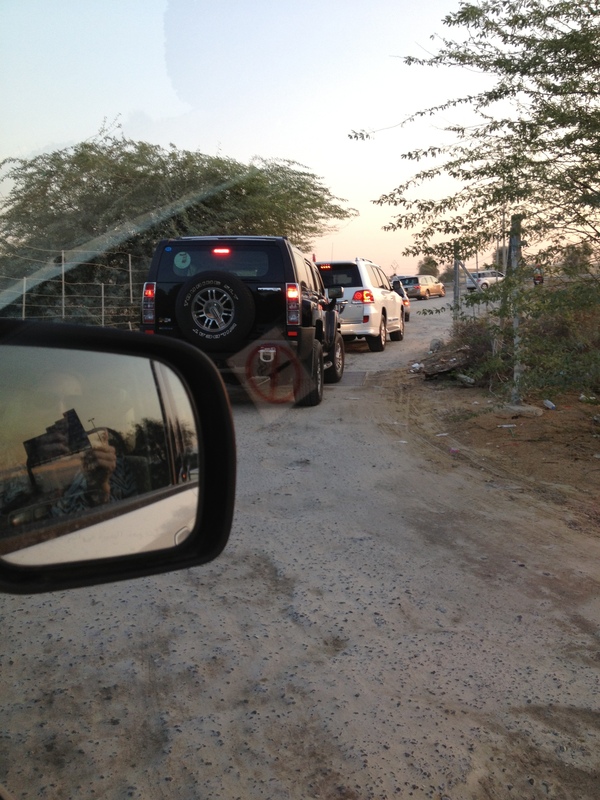 *sigh*…… just another tiny little joy of life/traffic in Dubai! Apparently, huh? But, it’s not uncommon here – people just sorta do whatever they want…. miss your exit? Stop, backup and head down. Too far to back up? Find a break in the guard rail and head down the hill. Weird. Thanks for stopping by! Holy moly! I feel like a celebrity has just knocked on my front door – and I’m so happy you’re enjoying my efforts. There are so many photos and ideas and half-started bits and pieces of things that I want to share – it’s simply a matter of focusing long enough to actually DO it, you know?? I’ll make even more of an effort to do that – and I especially want to share “The Nutmeg Incident”…. Thank you for stopping in, I’m grateful for your comments!